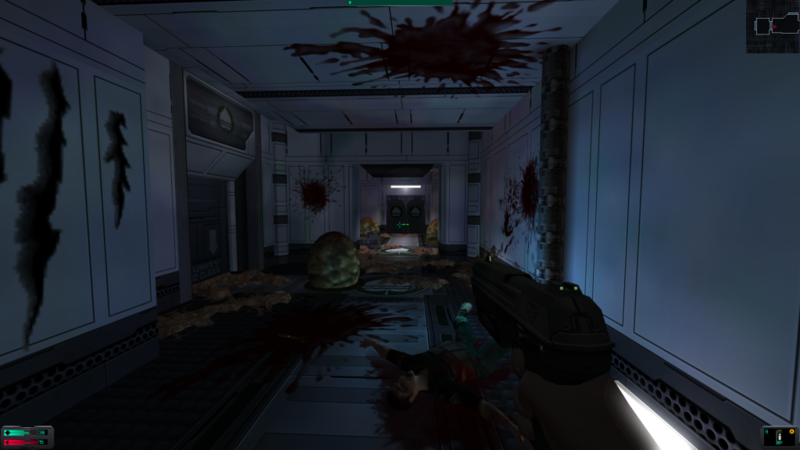 System Shock 2 is an interesting game to review in 2013. When it first came out in 1999, it was met with a lot of praise from the gaming press, winning over a dozen awards, including several “Game of the Year” titles, and since then it has appeared on several “Greatest Games of All Time” lists. However despite the praise, not many people actually bought and played it. It feels like System Shock 2 has been granted a second chance though. The success Irrational Games has had with BioShock and BioShock: Infinite has interested people enough to want to check out System Shock 2, which was the first game Irrational created. This is great news, because while you might not expect it, I feel that System Shock 2 is the best of all the “Shock” games. It makes you realize that for all of the steps forward we have taken in terms of technology, in a lot of ways modern gameplay has taken a few steps backwards. System Shock 2 takes place aboard the world’s first Faster Than Light starship the Von Braun as well as the UNN heavy destroyer the Rickenbacker which was tethered to the Von Braun so it could make the FTL jumps as well. You, the player, wake up from Cryo Sleep 5 months after the ship has left earth. It appears that while you were sleeping some force has managed to hijack the ship. You spend much of the game trying to figure out what exactly happened while you were sleeping, getting ship systems back up and running, and coming up with a plan to stay alive. The primary story of the game is told through many audio logs scattered around the ship that were left by the dead crew members, as well as visual clues in the levels that shed some light on what has been going on. 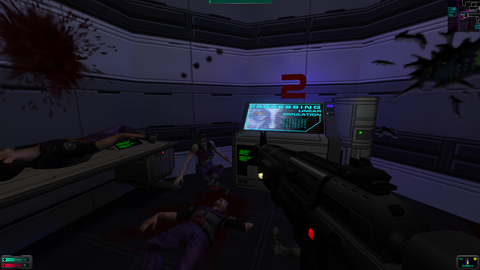 System Shock 2 was one of the first games to use this method of storytelling, which has only recently started to become popular. Both the Von Braun and Rickenbacker are both pretty large ships, and the game does not have any real “levels” in the traditional sense. The ships are broken up into decks (medical, engineering, hydroponics, operations, etc), and each of those decks are broken up into sectors that are separated by bulkheads which often require keycards to access. You are always free to move back and forward between decks and sectors you have gained access to. The game treats the ships as one large persistent game world. For example, if you come across some heavy armor that you do not have the required strength to equip, you can always come back to it later once you have the required stats. Or if you drop an item in a hallway that you do not have space in your inventory for, you can come back and get it hours later if you feel the need to. In fact, this sort of back tracking is sometimes necessary, as certain areas of the ship are only accessible after you do something in a different area. 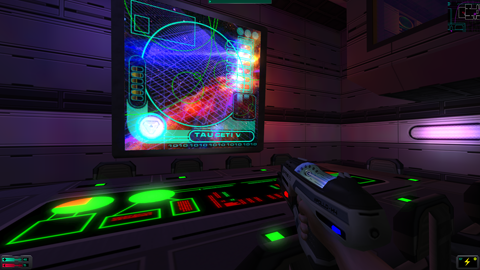 While the game is linear as far as some areas are locked until you find the keycard or access codes, it occasionally lets you tackle multiple objectives in whatever order you see fit and explore the ship at your own pace. Speaking of stats like strength, the game has an interesting RPG like system that determines what you can and cannot do. As you complete objectives, you are granted access to “Cybernetic Modules” that you use to upgrade your abilities. You spend these points at upgrade stations around the ship. There are four main categories of upgrades: stats, psi, weapons, and tech. Stats include things like strength, endurance, and agility. The weapons category contains sub-categories such as standard weapons, heavy weapons, and energy weapons. The tech category is where you find the skills associated with hacking, repairing, and modifying. The Psi category has five separate tiers of power, which need not be learned in order. Each tier includes seven individual powers. These powers compare pretty favorably to the plasmids from Bioshock, and include abilities like Photonic Redirection (turning yourself invisible), Enhanced Motion Sensitivity (shows enemies nearby), and Projected Pyrokinesis (shoots a ball of fire). The game has more gameplay systems then just the skills. Let’s use the weapons as an example. Each weapon as multiple fire modes that have strengths and weaknesses, such as an overload shot for a laser pistol that does more damage but is energy inefficient. On top of this, each weapon can be modified, provided you have the appropriate skill level. Examples of modification include increasing the clip size, increasing the rate of fire and decreasing kickback. Each time you fire a weapon, its condition starts to degrade, and you must use maintenance tools to keep the weapon in working order. If you neglect a weapon long enough, it can actually break. At that point you need to repair the weapon before you can use it again. On top of this, many of the guns have different types of ammo such as armor piercing rounds and anti-personnel rounds. How does one know what type of ammo to use against each enemy? That is where researching comes in. When you kill enemies, they often leave behind organs that you can collect from their bodies. If you have a high enough research level, you can research these organs to learn more about the enemies you are facing. It will tell you what types of weapons they have resistances to, which types of weapons they are extra vulnerable to, and it will also give you a buff to all damage done to them. Researching isn’t limited to enemy organs either. You will often find exotic weapons and items that you cannot use until you have researched what they are. Researching items requires different chemicals as well. Which chemicals are required depends on the item. Each deck of the ship has a chemical storeroom that contains a selection of most (but not all) of the chemicals that you need for research. If you are researching an item that requires a chemical that is not in the storeroom on your current deck, you will need to locate the proper chemical somewhere else. 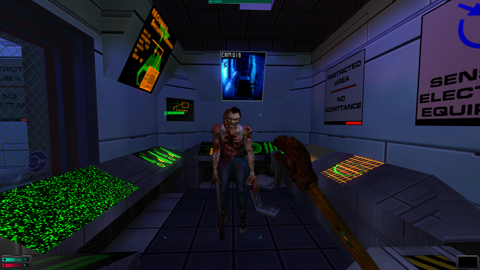 Since System Shock 2 is a survival horror game at its core, you spend a lot of time managing and rationing your supplies. You don’t always want to fight every enemy you come across, otherwise you might find yourself out of ammo. Running from or sneaking by enemies are always valid tactics. You can sometimes take more creative approaches as well, such as hacking a turret and baiting enemies into its firing range. There are also vending machines located throughout the ship, which you can spend money (Nanites) that you collect on items such as ammo and health. Not every vending machine sells everything, and you can hack the vending machines to offer you better prices. Nanites are also the currency used to hack, modify, and repair items, so it is up to you to determine the best way to use your supply of them. All of these layered gameplay systems are what make System Shock 2 stand out as surprisingly modern when compared to current games. Even Bioshock, a critically acclaimed modern game, feels a bit shallow when you compare it to System Shock 2. I would even go as far as to say Bioshock is a watered down version of System Shock 2. This complexity also opens the game up to be played multiple times, and each time you can build your character in drastically different ways. Want to play the game as a stealth character, only killing when absolutely necessary? That’s possible. What to build a melee weapons only character? That’s also possible. 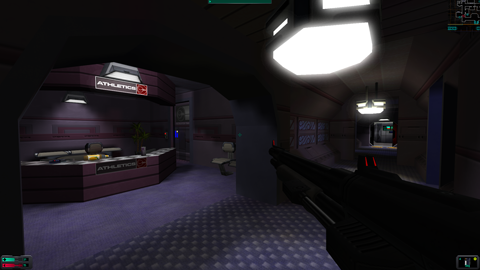 The only thing about System Shock 2 that feels dated are the visuals, and even that can be mitigated to some degree with mods. The story is great, the audio design is both haunting and impactful when it needs to be, and the gameplay was so far ahead of its time that even modern games feel shallow in comparison. If you can get over how the game looks, I would absolutely recommend giving this first person survival horror RPG a try. It might just be your 2013 game of the year… from 1999.